Dianping or Meituan might be the first destinations for most price-sensitive Chinese peoples when they are looking for a nice restaurant to dine out. But for visitors to Shanghai who can’t read Chinese or are willing to pay a little bit more for a nice dinner, IndugeSmart might be a better choice. 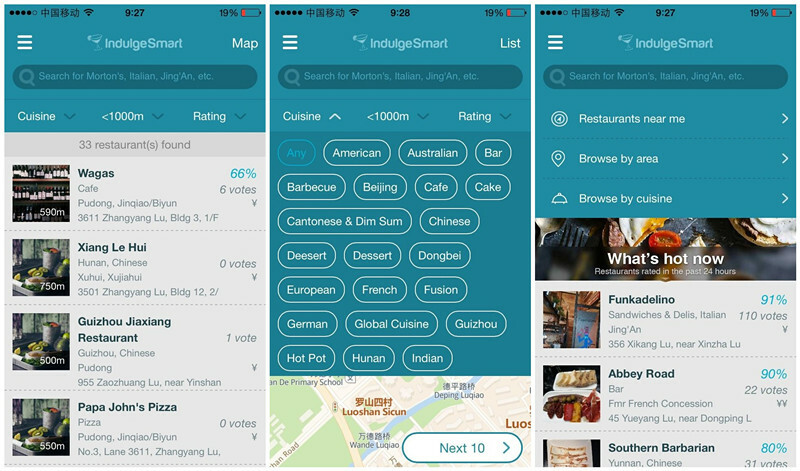 IndulgeSmart is an English-language app made and used locally, helping people find restaurants and bars by location, cuisine or price. IndulgeSmart differentiates itself by being specific and intelligent: instead of giving users undifferentiated restaurant info, as Dianping does, IndulgeSmart deletes the irrelevant ones, such as restaurants that are too far to travel from current positions, while users’ dining preferences, price ranges and dining history are stored in their personal profiles, to narrow down the recommendations to three to five items. Moreover, most local restaurant rating site users are Chinese, whose tastes might be very different from those of foreigners. IndulgeSmart will give reviews on restaurants from foreigners’ perspectives. It also supports the sharing of restaurant info with WeChat friends. When talking about competition from SmartShanghai and CityWeekend, two popular services for expats in China, the startup’s founder and CEO Stone Shi said these two services are run by a group of very smart insiders, telling people what events you shouldn’t miss out on the weekend. As a new vertical entrant, IndulgeSmart is a platform powered by its users, adopting a UGC model and telling users how smart you can be yourself when digging restaurants and bars, probably with the help of your friends. The early adopters of IndulgeSmart are expats living in Shanghai, short term tourists in Shanghai and Chinese returnees from overseas. Given the higher purchasing power of this demographic, IndulgeSmart is focused on restaurants with a price rage of RMB70 (US$11.4) per person or above, a mid-to-upscale market in China. Stone noted that this sector is quite widely available, citing a report that 20% of restaurants in Shanghai and other mega cities in China charge an average RMB70 per person. IndulgeSmart now has iOS, Android, and PC versions with over 5000 restaurants in the network, according to Stone. The startup plans to firmly establish its product in Shanghai before branching to other first-tier Chinese cities. “We are aiming for the Greater China region in two years and quite possibly international markets at a future point”, he said. Stone Shi, IndulgeSmart founder and CEO, has 12 years of experience in product management and marketing strategy, from Silicon Valley startups to multinational corporations. The company is now supported by an eight-member team with international backgrounds.